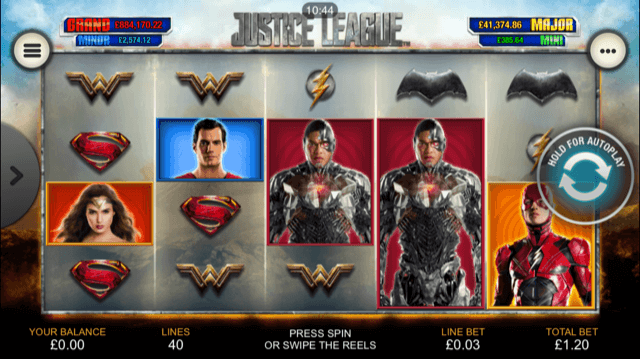 Justice League slot machine is the much anticipated game from the Playtech slots team that has a release perfectly timed to coincide with the new film of the same name. The game looking incredibly good, featuring many of the Justice League superheros on the 5 reels of the mobile slot. There are 7 massive bonus features including the Super Hero Respin feature, six free spins bonus features including the volatile Batman Free Games feature and of course the DC progressive jackpot. Keep reading below for the full Justice League slot review. Perfectly timed to coincide with the release of the movie in cinemas nationwide, Playtech’s all-action new Justice League slot is undoubtedly one of this winter’s most anticipated titles – but does the game live up to its lofty billing? A five-reel, 40-payline title, the Justice League slot machine certainly looks and sounds epic. Designed using imagery from the actual film, the high-value symbols to feature in the game are all well-known superheroes including Superman, Batman, Wonder Woman, Aquaman, The Flash and Cyborg. The game itself, meanwhile, takes place in front of a backdrop depicting a smoking mountain, with a typically rousing action-movie soundtrack really improving the atmosphere and getting players in the mood to win. Playable from as little as £0.40 per spin, Justice League can be enjoyed across all desktop, mobile and tablet devices and features a maximum base game jackpot of 500x their bet per line amount. Though a bit on the low side, the slot is also connected to the DC Super Heroes progressive jackpot. In terms of the bonus features in the Justice League slot, players will first be able to benefit from randomly-triggered Super Hero Respins in the base game. These respins see a feature frame appear on the reels and turn all instances of one of the superhero icons wild, with this happening up to five times. This in-reel bonus, however, pales in comparison to the main feature, which is triggered by landing scatter symbols on reels one, three and five simultaneously. Once this happens, players will be given a choice of six separate free spins features – one to represent each superhero – with the number of free spins they receive here being balanced against the effectiveness of the feature frame included. In total, players will be able to claim between 2 and 30 free spins, with the highest number giving them a single feature frame that turns any super hero symbol that lands in it into a wild and the lowest number seeing the same feature frame turn ALL superhero symbols wild if one lands in it. All things considered, the Justice League slot is a game that largely lives up to the hype. The game both looks and sounds great, but it’s the top-notch bonus feature that will keep players coming back for more. Like the Justice League slot review? Check out these as well…..